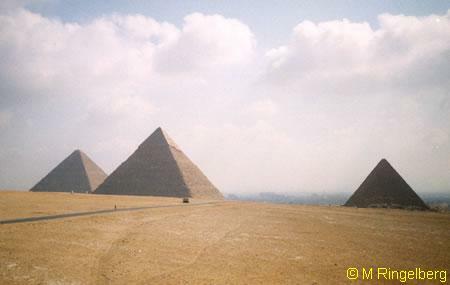 There have been so many truths and lies written about the famous and endlessly researched pyramids of Egypt. After centuries of research and speculations one is still not in agreement over, who, what, when and how the Great Pyramid has been built. Modern day Egyptologists are in agreement that Cheops is the builder of the Great Pyramid. Egyptologists are certain of this. There isn't a doubt possible especially considering the fact that above the 'kings chamber' in the so called 'decompression chamber' a cartouche has been found with the name Cheops written on it. According to Egyptologists this is the most convincing piece of evidence that Cheops built the Great Pyramid. However the originality of the cartouche of Khufu has been doubted ever since the 'discovery' of the cartouche of Khufu by Colonel Howard Vyse in 1837. Quite soon after his 'discovery' one thought that he had possibly painted the cartouche in a highly ambiguous location himself (one of Vyse's co-workers noticed that the paint used on the cartouche was still wet). After some very thorough research Zecharia Sitchin was able to produce enough evidence in 1980 that the cartouche was an imitation. Sitchin tells us that the cartouche was painted with symbols that weren't used for another 2000 years after the time of Khufu . Even though there is enough evidence against it many Egyptologists believe that this cartouche is the convincing bit of information that Khufu was the builder of the Great Pyramid of Giza. But is this true? Are the Egyptologists correct in what they are trying to fool us into believing ? Let's look at what other facts are available for us out there. Oddly enough these are facts that hardly any one ever speaks of because these facts originate from an Arabic source of old and can not be counted. 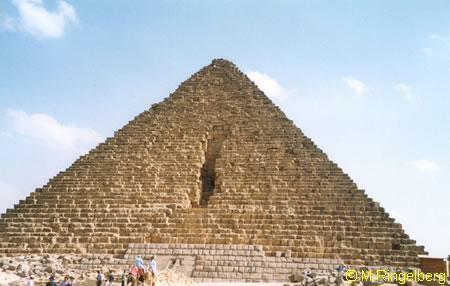 There are various reports written by Arabic chronicle writers that can tell us that the Great Pyramid of Giza was built before the all destructive deluge in order to save the knowledge that mankind had received from the gods. Several of these reports have been summarized in the Hitat of Al Makrizi (translated in the early 1900's from Arabic into German at the University of Leiden) A very detailed report is given over the Great Pyramid and the builder of it - an Egyptian king from before the deluge. At one time it was said that there was a white outer shell on the Great Pyramid from which one could read when the Great Pyramid was built. In the year 827 AD Harun Al Rashid appointed Egypt to his son caliph Abdullah Al-Mahmun. In this same year Harun Al-Rashid had already conquered North Africa in the name of the Holy War, the Jihad, in order to convert all the inhabitants of those regions to Islam. Al-Mahmun probably thought; 'I am the boss and Egypt is mine, the Pyramid is mine and I'm going to see what is buried in it especially since having heard the old legends of weapons that did not rust and glass that could bend'. It is most probable that this would have caused the whole outer layer to disconnect during the earthquake of 1301 AD. 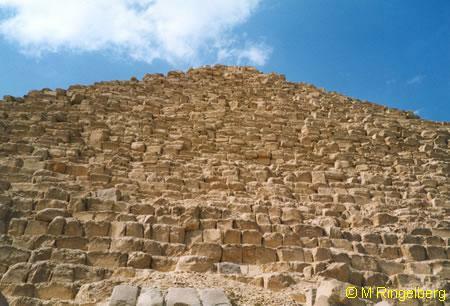 After the earthquake the stones were recycled to rebuild Cairo. Around the year 1200 AD Dr. Abu Sahyd had his practice straight across from the Great Pyramid. He devoted most of his spare time to his greatest hobby; the Egyptian antiquity. He most likely had the texts on the Great Pyramid, which he wasn't able to decipher himself, translated by the Copts who were the only ones who had mastered and were still able to read old Egyptian writing. According to Abu Sahyd one of the texts said that the Great Pyramid was built in 'Falling Vulture in Cancer'. What does this phrase mean? and can we determine from this fact exactly how old the Great Pyramid of Giza really is? I think so. The Sun is always ahead in the Zodiac except for in the springtime when the Sun runs behind, as if it were falling. To summarize the ancient pyramid text - it says that the pyramids were built in Falling Vulture in Cancer'. If we translate this into plain English then it says that the pyramid was built when the Sun lowered into springtime in the period of Cancer, which ran from approx. 8810 - 6650 BC. The signs of the Zodiac run backwards, currently we are living in the time of Pisces. Before that there was Aries, Taurus, Gemini, Cancer and Leo. If the Arabian legends are correct then something is not right because apparently the Great Pyramid was built before the great fold which we just saw was during the period of Cancer which ran from approx. 8810 - 6650 BC. So were the Arabian historians way off or were they correct? Egyptian priests had told Herodotus that the Sun had risen four times outside of it's 'normal' place, that is to say twice where the Sun sets and twice where the Sun rises. According to current day scholars it is simply not possible that the Sun rose in the west so the the part where Herodotus tells us of the Egyptians is simply wiped off the table as a misinterpretation. But Herodotus wasn't crazy, he was right. In his book 'Astrology of ancient Egypt' Albert Slosman gives a literal translation of the Egyptian hieroglyphics which tell us that the Earth turned 180 degrees during the Great Disaster (the deluge). Ancient Arabic chronicle writers also noted that; 'the reason Saurid had the Great Pyramid built was because he had a dream 300 years before the devastating deluge that the Earth turned, the people sought refuge, and that the stars came tumbling down'. After the Earth had turned 180 degrees and retained her normal rotation on her axis that is when it appeared from the Earth as if the Sun rose in the west. The logical consequence of that being that the Zodiac also ran in an opposite direction and that is why the period of Cancer came before the period of Leo. If we start calculating backwards then we get the following results; Pisces, Aries, Taurus, Gemini, Cancer, Leo, the deluge at which point the Earth rotated 180 degrees and before that the period of Cancer, because the Sun went throughout the Zodiacs in an opposite direction during that time period and from the Earth it appeared that the Zodiacs had a different order then what we have today. Herodotus was not crazy! He wrote down precisely what the Egyptian priests had told him. If we examine all these facts in a logical manner and not be too quick to say that some of these facts don't make any sense because we don't know where they fit into the big picture just yet or that some historian did write down the facts incorrectly then we conclude nothing different then the fact that the Great Pyramid built in 'Falling Vulture in Cancer' is 15,000 years old. It is in this manner that all the previous facts including the Arabic ones, come to a very logical conclusion; they tally up! Muhammad ben Abdallah ben Abd el-Hakam gives us a very simple and logical explanation as to why we know that the Great Pyramid is from before the deluge. That simply being the fact that if it was from after the deluge, mankind would know a whole lot more about it today. In my opinion there isn't anything that can be brought up to oppose this simple verdict even though many a man would like to.